I've been looking into a number of sensor fusion techniques, including Particle Filters and Kalman Filters (EKF,UKF, etc). I was looking for something easy to implement, easy to use, and not too computationally intensive. 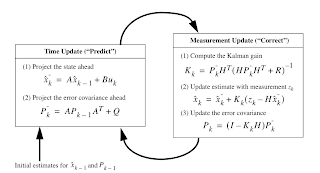 I've always been a bit sceptical as to the advantages of a Kalman filter over an Alpha-Beta filter, in terms of performance gained vs cost (i.e. : difficulty to implement & use). For most simple tasks, the Alpha-Beta filter seems to work fine. (Similarly ABG vs AB). Kalman filters in my opinion have as a major disadvantage of being difficult to use (you need to construct multiple models), but are relatively easy to implement and computationally efficient. Thus, the use of an existing library doesn't help much. Wikipedia provides an overview of Kalman filters, but the real problem is in understanding what all the symbols actually mean, and how it works. Like alpha-beta, Kalman filters are prediction-correction filters. That is, they make a prediction, then correct it to provide the final estimate of the systems state. Alpha-Beta's don't have a natural extension to include control inputs, or system identification techniques. They are also (effectively) constrained to linear position/velocity tracking. Kalman filters can be extended to handle non-linear conditions. H - is the measurement matrix (what are we measuring?) e.g. : position or velocity, etc. Tyvm for sharing your learning. I've learned some with ur sharing. Mainly about the definition of each symbol used on the equations, that was really helpful. amzing work man!! !it was a lot of help to me in my thesis work, i'm doing. Thanks!! Your welcome. What is your thesis topic? Actually working on target tracking in underwater sensor networks. Thanks a lot for the explanation. Good job! I have a few questions that maybe you could answer. What does the T represent that some terms are being raised to? I am attempting to apply this filter to a value that is expected to increment by a constant at each step but never increments exactly. Let's say that in your example the initial constant were expected to increment by 0.5 at every iteration. A * last_step = last_step +0.5? If I expected the error in the increment to be +/- 0.2 at each step would Q be 0.4? Is it acceptable to calculate the value of Q as we go along or does the initial value relate to how fast the filter converges to minimize the error? Ok. I guess the T is a transpose which in my case would just be A itself I assume. Any insight on the last two questions would be appreciated. A very nice tutorial. Do you have a tutorial that describe the same problem using EKF? Hi,you have explained nicely, I want to use the same code to predict the future location of a car using gps coordinates how i can proceed? Hey, thanks for nice blog. I want to know what is frand() and srand(). Please give clear ideas. i hope that you help me. my master student thesis has about estimation of state of charge of li-ion battery . 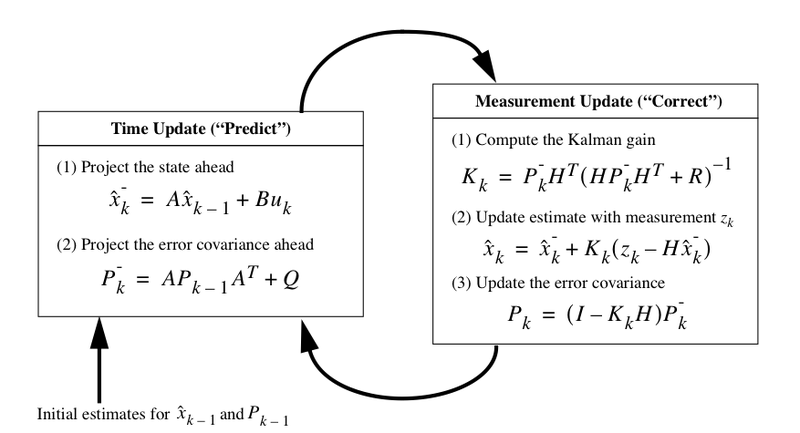 in SOC(state of charge)method usage the extended Kalman filtering for estimating. I have a big problem in noise Covariance matrix calculation. my mail:mohandesvahidpour@gmail.com ... tanks my dears. How we can JUST know the Q and R matrix? Can you give an example? I thought we can get this in Kalman filter Algorithm. Is this impossible?